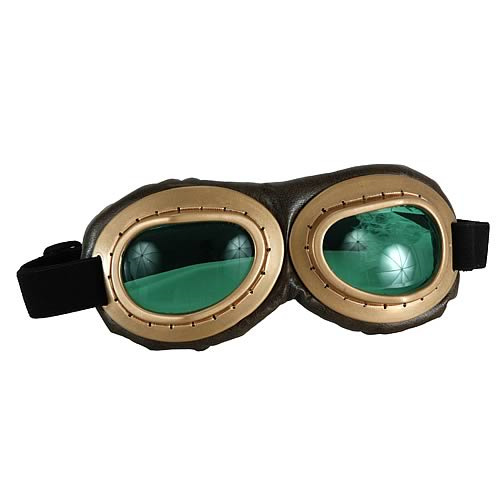 Join the retro-future world of Steampunk, with these Gold/Green Aviator Goggles! Inspired by a melding of Victorian-era Britain and the fantastical designs of authors like H.G. Wells and Jules Verne, these goggles are spot-on replicas of the originals worn by the dog fighters of yesteryear. With their faux leather padding and high quality plastic frames, the only thing you'll have to worry about is picking the bugs out of your teeth. The perfect addition to your steampunk costume! One size fits most adults and kids ages 14 and up. Measures about 7-inches wide. Order yours today!